They're a unique way to experience the Will Smith-narrated "One Strange Rock." When it came time for National Geographic to build an immersive experience for its new show, One Strange Rock, the network didn't want another virtual reality experience. 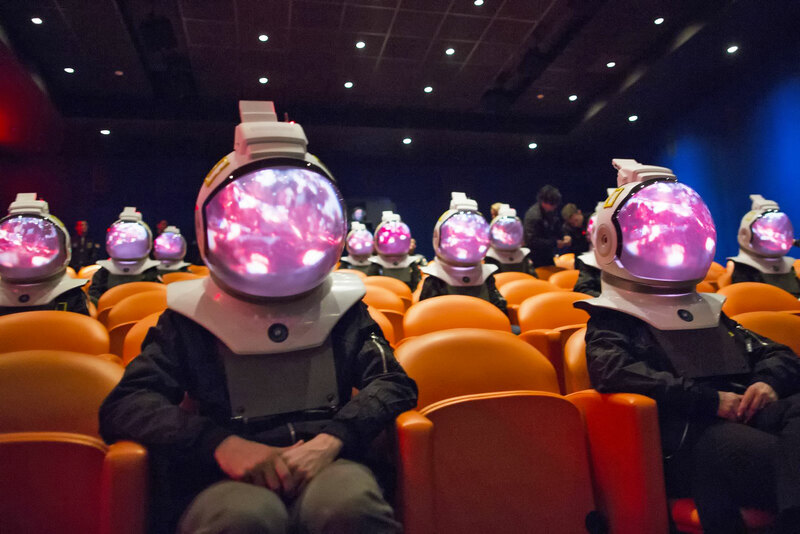 So it worked together with McCann and New York City-based Tomorrow Lab to build something entirely new: Space Projection Helmets. From the outside, they look like replica NASA gear -- fitting since One Strange Rock is focused on astronauts and their view of Earth. On the inside, though, they have all of the equipment necessary for a personal theatrical experience. You can think of the helmets as mini OMNIMAX cinemas, the dome version of IMAX screens typically found in science museums. Putting one on is almost like gearing up for space, at least based on my demo at a media event in New York. A helper first placed a harness assembly over my head, which includes shoulder pads to balance it. I was then led into a theater, where another worker carefully placed the helmet over my head and locked it into the harness. After that, I slid down the visor and prepared to launch into virtual space. Wearing the Space Projection Helmet is a strange experience at first -- you've got the freedom to move your head around, just like a real astronaut. But it felt more claustrophobic than wearing a VR headset, since your head is literally trapped in a tiny space. Each helmet features a tiny 720p laser projector paired together with a fisheye lens. Together, they shoot a properly proportional image onto the curved visor. That surface is also transmissive, allowing anyone to see exactly what you're seeing in the helmet. As for audio, that's handled by a speaker built into the harness. Having seen plenty of weird projector contraptions, I didn't expect much from the Space Projection Helmets at first. But as I saw an image of Earth slowly appearing on a dark horizon, I started to see the appeal. It's not like VR, which sometimes feels as if you're looking through a pair of binoculars. It's a more natural way to render images, and it accomplishes precisely what National Geographic set out to do: Giving us a look at our planet from an astronaut's perspective. The demo reel only lasted a few minutes, but it highlighted some choice moments from One Strange Rock, like huge volcanic explosions and tumultuous thunderstorms. While I still prefer the sheer immersion of a proper VR headset, especially now that they're reaching higher resolutions, the Space Projection Helmets are an intriguing experiment. National Geographic plans to bring them to schools and planetariums this Spring. They're an ideal way to promote One Strange Rock, which is shaping up to be the network's biggest show yet. Narrated by Will Smith, and produced by Darren Aronofsky, it's an epic look at what makes our planet special, told by the few people who've seen it from space. We'll have more coverage on the show ahead of its premiere on March 26th at 10 PM Eastern.